Built in 1820, Glan Dwyryd provides the necessary essentials for a no frills, comfortable and relaxing holiday. The back of the house looks out onto a junction of two streams, with the sound of gently flowing water coupled with the beautiful view creates a feeling of timelessness and peace. The house has four bedrooms: two on the ground floor (a double and a single) and two on the top floor (a double and a twin), a kitchen, a conservatory, a bathroom and a living room. There are many books, DVDs and some games. so there is plenty to keep you occupied if the weather is bad. At the bottom of the garden, just above the bank of the stream, there is a balcony made of stones which is perfect for having an afternoon tea or a barbecue in the summer. 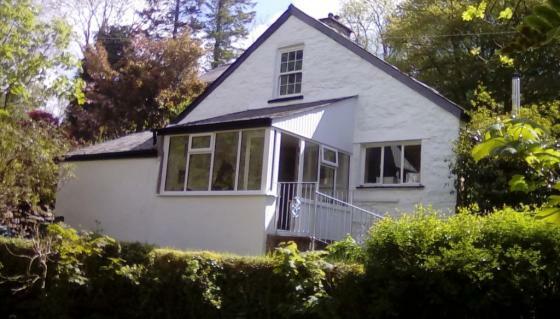 The house is situated within the Snowdonia National Park, in a little hamlet called Rhyd-y-Sarn. There are a number of excellent walks direct from the cottage without using a car. 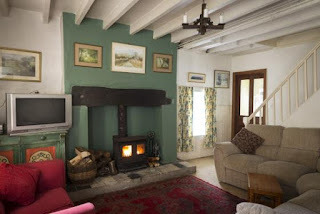 There are many days out nearby, with something to suit all ages & interests. Llechwed Slate Caverns are the perfect rainy day activity, with plenty to get your heart racing. Perhaps a relaxing trip on the Ffestiniog Steam Railway is more your thing, with beautiful views of the Welsh countryside to take in.